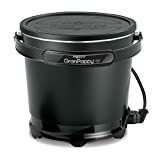 Overall, if you want the quickest and easiest way to make fried food in the comfort of your own home, the GranPappy Deep Fryer by Presto is a fantastic choice. Whether you’re making food for yourself or your family, this handy machine will make dinnertime your favorite time of day. Do you love fried food? Does the thought of a fresh batch of fried chicken make your mouth water? Are you tired of having to go out and spend money on your favorite dishes because it’s too hard to make them at home? If this sounds like you, then the Presto 05411 GranPappy Electric Deep Fryer is the answer to all your needs. 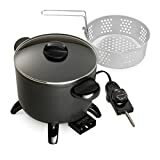 It is one of our best deep fryers for a small family. For most people, frying foods at home is a difficult task. Typically speaking, you have to warm up a pot of oil on the stove, which can become rather dangerous, with hot grease popping and spitting all over you while you cook. With the Presto GranPappy Deep Fryer, you can make all of your favorite dishes without having to do a lot of work. All you need is oil and an outlet, and you’re ready to go. If this sounds like something you’re interested in, then check out all that this fryer has to offer. First of all, you want to make sure that your new fryer is built to last. After all, if it will break down after a few uses, then what’s the point? 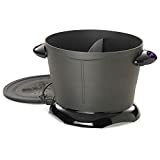 The GranPappy Fryer is made of durable cast aluminum, which means that it will stay in your family for years to come, no matter how many meals you cook with it. The inside is as durable as the outside, and because it’s aluminum, it won’t rust or stick with oil and food, making clean up a breeze. The design of this fryer is as unique as it is easy to use. A bucket style design means that you can place it almost anywhere on your counter and it won’t take up too much space. An insulated handle also makes it safe to dump the oil out once you’re finished. If you’re going to start frying foods at home, you don’t want to get a machine that will make you wait forever to get started. With a powerful 1500 watt heating element, the GranPappy can get your oil to the right temperature in just fifteen minutes, meaning that you will be ready to eat in less time than if you cooked using traditional methods. Also, with such a powerful machine, you don’t have to worry about the oil cooling off, either. That means that you can make multiple batches without any decline in food quality or cooking time. Do you live with 3-4 people? If so, then you’ll love the fact that this electric deep fryer can cook up to six servings at once. Therefore, you can feed everyone at the same time without having to wait for a second batch to come through. The GranPappy Fryer can hold up to six cups of oil, which is more than enough for fried chicken, french fries, and any other delicious dish you can imagine. To help you get your food out quickly, this fryer comes with a thick plastic slotted spoon. The spoon makes it easy to turn your food around to ensure that it cooks evenly, as well as pull it out once it’s done. Whenever you’re dealing with hot oil, you have to make sure that everyone stays safe. Thus, the GranPappy Fryer comes with some important safety features to ensure that you and your family don’t have any problems when cooking your next meal. First of all, this fryer comes with a lid to cover the top. That means that you don’t have to worry about hot oil popping and spitting all over the place. Second, it has non-stick feet so that if you accidentally bump into it, the device won’t spill over. Finally, it has a magnetic power cord that will shut off if bumped or jostled. The power cord is also easy to remove so that you don’t have to worry about the machine cooking while you’re not around. 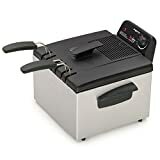 Essentially, this fryer is for anyone who wants convenience and loves to indulge in some delectable fried food every once in a while. Although this deep fryer is excellent for a lot of reasons, the fact is that not everyone will love it the same way. With that in mind, if you are one of these people, you probably won’t get much use out of this device. Basically, if you think that deep frying in your home is too much of a hassle, then you probably won’t want this machine.